The dead do not hide the truth and they never lie. 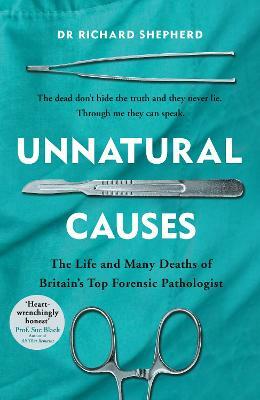 Through me the dead can speak ...Dr Richard Shepherd is the UK's foremost forensic pathologist, his job to understand the deaths which may have no natural cause. From crime scene to court room, his findings are crucial to the pur... read full description below. The dead do not hide the truth and they never lie. Through me the dead can speak ...Dr Richard Shepherd is the UK's foremost forensic pathologist, his job to understand the deaths which may have no natural cause. From crime scene to court room, his findings are crucial to the pursuit of justice. His work has seen killers put behind bars, exonerated the innocent, and turned open and shut cases on their heads. Shepherd's obsession with revealing the secrets of the dead is personal. At medical school, while performing his first autopsy, he held the heart of the patient in his hand and thought of his late mother, taken too early by heart disease. He became driven by the challenge of finding the truth, of seeing justice, and by compassion: sometimes for the dead, but always for those they have left behind. Thoughtful, revealing, chilling, sometimes bizarre and always unputdownable, Unnatural Causes is the true crime book of the year. Richard Shepherd was born in West London but grew up in Watford. At the local grammar school he was introduced to a medical textbook smuggled into the classroom by a friend which opened his eyes to the world of crime and murder, setting him on a lifelong quest to understand death in its many forms. He trained as a doctor at St George's Hospital medical school at Hyde Park Corner, qualifying in 1977 and then completed his postgraduate training as a forensic pathologist in 1987. He immediately joined what was then the elite forensic department at Guy's Hospital. He has been involved nationally and internationally in the forensic investigation of thousands of deaths from unnatural causes, from headline-making murders to mass natural disasters, and many sudden and unexplained deaths that his investigations showed were from natural causes or due to accidents. His skills and expertise still remain in demand around the world.